In the past year Martin Back has become very interested in the possibilities of improvisation-based, extended drone music and has founded an ensemble, The Myriad Eyeball Infinite Moment Music Group, in order to explore these kinds of musical activities. Back also performs drone-based works as a solo performer. In order to facilitate new sonic approaches in this work, primarily with regards to unique tuning systems, Back has created a custom, electric stringed instrument and custom voice-processing software. Back will continue to design and construct these kinds of instruments as necessary. By Alicia Eggert This flashing neon sign cycles through the statements "all the light you see is from the past" and "all you see is past" before turning off completely. It speaks to the fact that light takes time to travel, so by the time it reaches your eyes, everything you are seeing is technically already in the past. Light from the moon left its surface 1.5 seconds ago; sunlight travels for 8 minutes and 19 seconds before it touches your skin. The farther out into space we look, the farther back in time we can see. 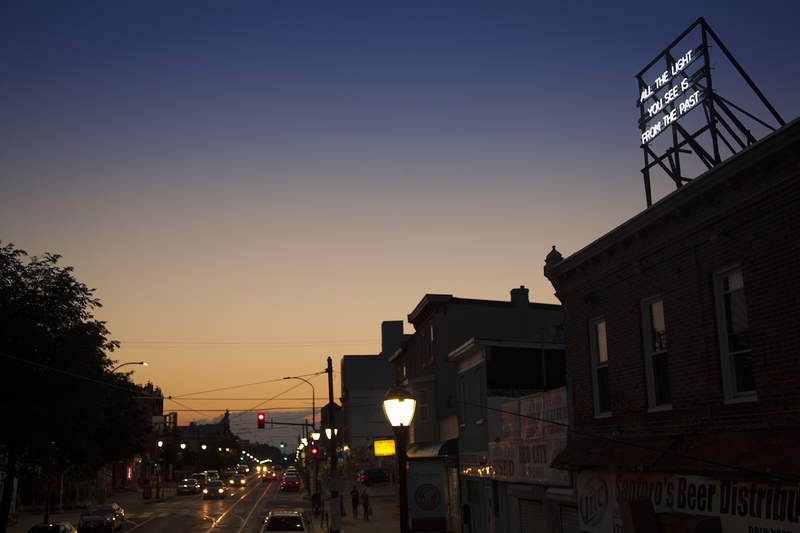 This sign, perched atop a building that will soon be demolished, is an image of what was. What will be remains to be seen. Curated and photographed by Ryan Strand Greenberg. Supported by Mural Arts Philadelphia, MM Partners, Fairmount CDC, and Gazelle Signs. Special thanks to Basmah Sorathia, Jacob Raeder, Layla Mrozowski, James Bonney, Frank Ramano, Rachel and John Easlea, Evan Inatome, and Joseph Amsel. materialssoundmusic is a project by iARTA member, materials scientist, and composer, Marco Buongiorno Nardelli. materialssoundmusic is a new computer-aided data-driven composition (CADDC) environment based on the sonification and remix of scientific data streams. Sonification of scientific data, i.e. the perceptualization of information through acoustic means, not only provides a useful alternative and complement to visual data representation, but provides also the raw data for potential artistic remixes and further musical interpretation. The materialssoundmusic project starts with the sonification of the materials property data from the online computational materials science repositoryAFLOWLIB.org. Databases such AFLOWLIB.org are of enormous scientific and technological value because they provide the materials scientists with complete compilations of materials properties that can be used for materials discovery, development and rational design. The initial process of sonification provides an abstract representation of the data that can be used for navigation and data mining of the database on scientific grounds. From there, the data stream is open for elaboration as principal element of a data-driven compositional environment. 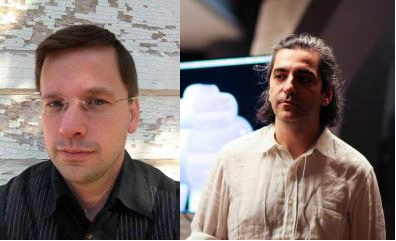 iARTA associated faculty James Thurman (Assistant Professor of Studio Art) and Panayiotis Kokoras (Assistant Professor of Music Composition) have brought together two separate courses in metalsmithing and composition for a collaborative project. In this project, the students in the senior-level metalsmithing studio class have to create a metal object that the music composition students use to make music. In Kokoras' composition class, the students have learned to make hybrid acoustic/electronic instruments using arduino controllers and other techinques. This cooperative instrumental design project challenges the aesthetics and techniques of both the metalsmithing and music students. "The ending product [for the metalsmithing students] may not have significantly changed, but the process will be very different due to the context." Thurman said. According to Thurman, this change in context also challenges the presuppositions of design culture in which the idea of the lone artist prevails over the potential of working together with others. "Within craft and design, there's a lot more reluctance for collaboration. The culture of the disciplines, oddly and incorrectly, promotes the idea of the lone artist doing their thing. But in my practice, both inside and outside of academia, I can't do anything without other people. There's always some kind of exchange, negotiation, and collaboration, particularly in the most successful projects." The overall emphasis of the project, in addition to documenting the student work as both a performance and an art-object, is to teach students to articulate their ideas and needs within a group. "The point is to eventually find the right team and stick with it," Kokoras said, "so the more you know how to cope with [collaborating in a group] the better results you can have." All in all, both Thurman and Kokoras seem pleased at the possibilities of the current project and potential future projects, "It's one of the richest semesters that I can imagine," Thurman said, "having both this collaboration project and the visiting artists we've had." 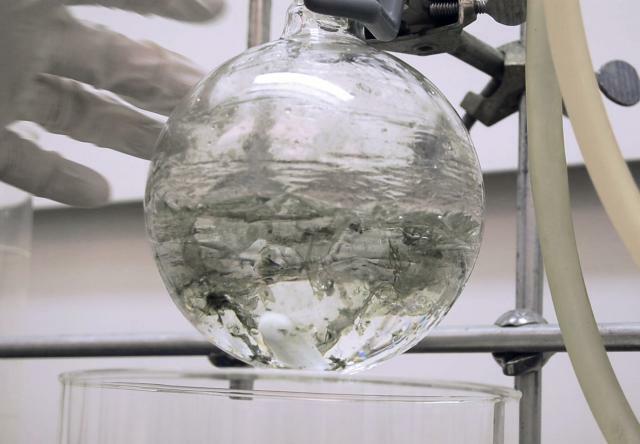 Shane Mecklenburger, iARTA member and Assistant Professor of New Media is currently working on a collaboration with UNT's Chemistry Department, private industry, and the Department of Studio Art. His project is called ArtGunpowder Diamond in which a diamond is fabricated from carbon found in common assault rifle ammunition. It is the first installment in Cost of Opportunity, a series of diamonds fabricated from unlikely carbon-based materials such as devalued foreign currency and rainforest foliage, exposing the relationship between values and valuation. pwn3d is a series of media performances, installations, videos and objects that explore the dramas of control, conflict and chaos enacted by popular first-person shooter games and simulation technologies. Mary Lynn Babcock, Ph.D. In Dance and Professor in Department of Dance and Theatre is working on a new project which includes real time manipulation of digital media that is created for projection to be integrated into live performances. This project which is called Eclipse Project centers on the interactions between the live and virtual body as intimate players of power. Through the use of video with live performance this project will also be simultaneously presented at 2 or more remote locations. Kenneth Verdugo, Assistant Professor, Dept. of Dance and Theatre is developing a multimedia piece with Venezuelan composer, Jeffrey Gascon. Verdugo's contributions include projections, set pieces and participation as a percussionist on both electronic and constructed found-object instruments. He has a forthcoming article to be published by USITT (topics include: 5D Immersive Design and the new paradigm shift in narrative story creation). According to Professor Verdugo, most of his current pieces are "reflective of technology as either the driving force in the design process and/or as the final presentational product.